This is another episode of “Previously on Amara”. This one is from September of 2008, she was almost 4 1/2 and full of the sillies! I can’t remember exactly what Amara and I were talking about but it had to do with her birthday party back in April. I think I asked her if she wanted to play in her costume, she loves to play dress up. 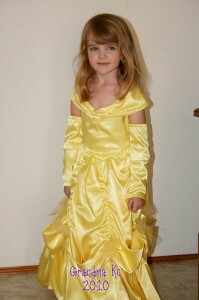 Amara is lucky enough to have 2 Grandma’s that like to sew and Grandma Judi had made her a beautiful Princess Belle gown to wear to the party that year. But when I asked her about playing dress-up she started telling me that she couldn’t remember her last birthday party or her costume or anything! She then went on to tell me in her own wonderful way “I think my brain is acting up” — “there might be something wrong with it”. I was hysterical! PS She can still fit into the costume! Just click the picture to see how cute she looks in it now! 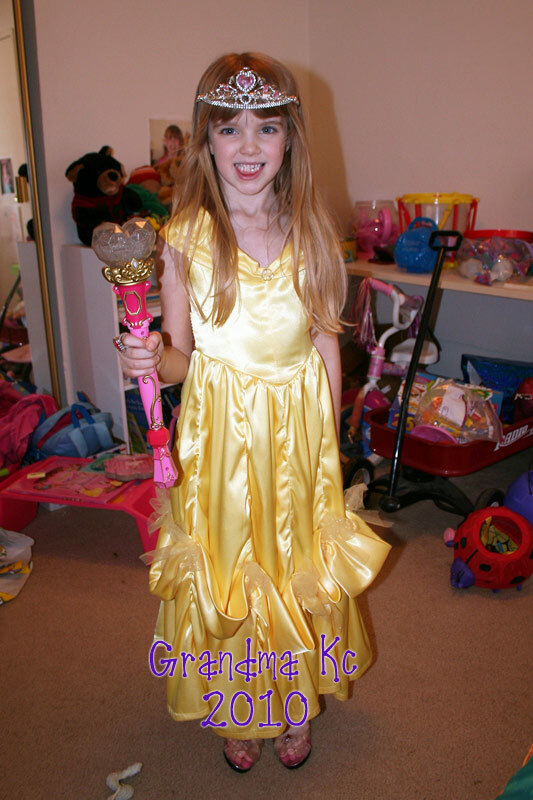 This memory was posted in Indoor Fun, Previously on Amara, Special Occasions and tagged Amara, Belle, birthday, costumes, Princesses on May 26, 2010 by Grandma Kc. That dress is gorgeous, wonderful that she can still wear it! Amara is very much like her Grandma! My brain doesn’t always work right either! She is adorable in that dress! I can relate to….my brain doesn’t always work right! Thanks Jackie! She is so funny and such a joy to be around! She is adorable in that dress! How old was she in the first picture? That first picture was taken at her 4th Birthday Party — April of 2008. She is just the best! A true Princess I think! That is so funny! Kids say the greatest things don’t they? And that dress is to fabulous! I bought the pattern, never made the dress 🙁 she is so beautiful in it, both pictures! Thanks for linking up with me!